Das Deutsche Zentrum für Luft- und Raumfahrt (DLR) sucht in Deutschland nach einem möglichen Landeplatz für Raumschiffe. Mecklenburg-Vorpommern wird als idealer Standort gehandelt. Im vergangenen Jahr seien in Vorstudien verschiedene deutsche Flughäfen unter die Lupe genommen worden, unter anderem Rostock-Laage, sagte DLR-Sprecher Andreas Schütz. Ergebnisse der Untersuchungen seien ihm noch nicht bekannt. "Sicherlich ist der Dream Chaser ein mögliches Beispiel", sagte Schütz. Das Raumschiff soll ab dem Jahr 2017 Astronauten zur Internationalen Raumstation ISS bringen. Das Handelsblatt und die Wirtschaftswoche hatten berichtet, der Konstrukteur des Dream Chaser, das US-Luftfahrtunternehmen Sierra Nevada Corporation (SNC), suche in Deutschland nach Landeplätzen. Vor allem Mecklenburg-Vorpommern wäre mit wenig Flugverkehr und dünner Besiedlung ideal, sagte demnach Jürgen Drescher, der in Washington das DLR-Büro leitet. SPARKS, Nev. (Feb. 3, 2015) – Sierra Nevada Corporation’s (SNC) Space Systems and OHB System AG (OHB) announce the completion of the initial Dream Chaser® for European Utilization (DC4EU) study co-funded by the Space Administration of the German Aerospace Center (DLR) and OHB. OHB and DLR are both based in Germany. 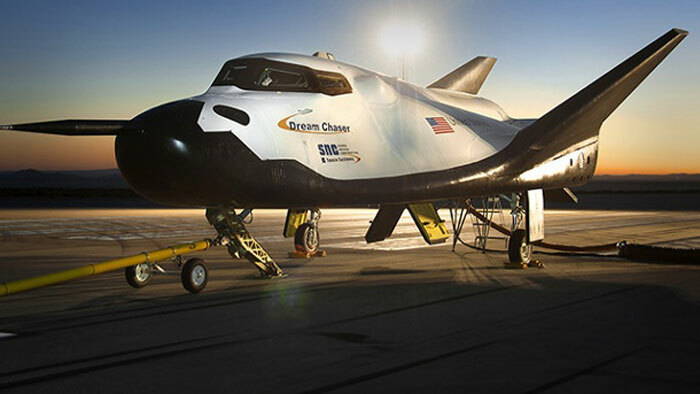 As announced by the companies in late 2013, SNC and OHB entered into an agreement to study the feasibility of using SNC’s Dream Chaser spacecraft for a variety of missions. The DC4EU study thoroughly reviewed applications for the Dream Chaser including crewed and uncrewed flights to low-Earth orbit (LEO) for missions such as microgravity science, satellite servicing and active debris removal (ADR). In addition to the study, OHB supported SNC as an exhibitor at the American Society for Gravitational Space Research Conference in late October. During the conference, SNC presented the Dream Chaser spacecraft microgravity research capability for the first time including the debut of a full scale mock-up of the Dream Chaser for Science mission variant. The DC4EU study is SNC’s first contracted international effort to explore the broad capabilities of the Dream Chaser vehicle. “We highly value our partnership with the German Aerospace Center and industry teammates, we see this study as the first step towards achieving broad scientific and servicing applications for international missions,” said Dr. John Olson, vice president of Space Exploration Systems for SNC’s Space Systems. “SNC is currently working with OHB on the next phase of our ongoing DC4EU collaboration together with DLR and will be announcing further details in the near future. SNC’s Dream Chaser is a multi-mission-capable space utility vehicle that is able to flexibly operate as an independent science platform, logistics enabler, or orbital servicing vehicle with the ability to deploy, retrieve, repair, replace, refuel, or assemble items in space. Dream Chaser provides the only reusable, human-rated, lifting-body spacecraft with a commercial runway landing capability, anywhere in the world - offering safe, affordable, flexible and reliable transportation to space. The systems specialist OHB System AG is one of the leading independent forces in European space. We have been making a name for ourselves on the market with our creative and business approach for a good 33 years particularly in our core business comprising low-orbiting and geostationary satellites. We are developing and executing some of the key projects of our times such as the Galileo FOC navigation satellites, In manned space flight, we are working intensively on humanity's most remote outpost, the International Space Station ISS. We were materially involved in assembling and equipping the Columbus research laboratory fitted to the ISS and the ATV space freighter as well as numerous experiment systems used on board the ISS.